Add Yeast and sugar. Mix and let the mixture rest for 10 minutes. Add 3 tbsp. melted unsalted butter, 1 tsp. salt and 3 cups all-purpose flour. Mix together to make a sticky dough. Lightly dust your clean counter. Empty the dough and knead it for 8-10 minutes. This is the most important stage to develop gluten, and make the dough elastic. Keep the dough in a greased large bowl. Cover and let it rest for an 2 hour. Use a tray or baking box 9″X13″ to arrange and bake pav breads. Grease with oil and dust it with flour. After an hour the dough should have doubled in size. Knead the dough again for 8-10 minutes. Divide into 12-15 parts, and arrange them in a tray leaving 1 1/2 inch space in between. Cover and let the dough proof for 45 minutes to 1 hour. Proofing is the process just before baking. The dough is covered and is allowed to rest to double in size. Bake in a 220 c preheated oven for 8-10 minutes or till they get lightly browned. Let them rest on a cooling rack. 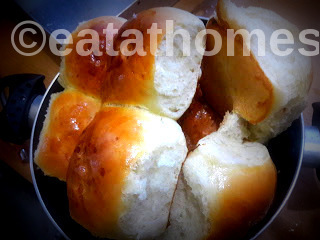 Serve this pav with tea / dinner or make vada pav, pav bhaji or puneri missal for perfect combination.